Eight years ago, in a Marvel Universe far, far away, Spider-Man was married. Then Marvel editorial had him make a deal with the devil—a villain called Mephisto—and he wasn’t a husband anymore, like it had never happened. It was stupid. People hated it. This week, Marvel’s teasing fans with the a world where that bonehead move never happened. Spider-Man: Renew Your Vows is a tie-in miniseries spinning out of Secret Wars, the big crossover that promises to reconfigure the Marvel Universe once it’s all done. In the mainline event title, a near-omnipotent Dr. Doom has tried to prevent the eradication of everything by stitching together a patchwork world made from various alternate Marvel realities. Among those realities is one where Spider-Man’s marriage wasn’t voided by editorial edict. 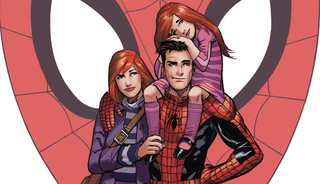 In Renew Your Vows #1—written by longtime Spider-scribe Dan Slott and drawn by Adam Kubert— Peter Parker and Mary Jane Watson have gone on to have a daughter. Peter tries to balance his nocturnal crime-fighting with parental duties. It’s a challenge, but MJ and Peter tacitly agree that he still needs to be Spider-Man for the greater good. But this is Peter Parker we’re talking about here, and any happy ending he gets is obligated to get rocky once the wall-crawler is all smiles. Other superheroes in Manhattan have disappeared, leaving some of their nemeses for Spider-Man to deal with. The disappearances get serious enough to warrant the attention of the Avengers. Earth’s Mightiest Heroes offer Spider-Man the chance to move in with the team and Spidey, like any good husband, talks it over with his wife. Without spoiling the more dramatic events of this issue, suffice it to say that familiar Spider-themes of guilt and sacrifice pop up. The stakes are more personal. Most importantly, Renew Your Vows shows that a married Spider-Man can be a viable concept. The worst part of the 2007 editorial decision to wipe away Spider-Man’s marriage in the One More Day storyline was that it seemed like Marvel’s creative leaders were admitting that they couldn’t tell stories about a superhero who getting older. This was a Peter Parker who moved beyond being broke and lovelorn. He had finally mustered enough confidence to figure out how to be both a superhero and a committed spouse, without too much neurotic second-guessing. That Peter was growing up along with his readership. First and foremost, I think Peter getting divorced to me says that they gave up on their love, that their life in love together was so awful, so stressful, so unfulfilling that they had to raise a red flag and walk away from it. They quit on their marriage and even more tragic, the quit on each other. In other words, Peter would rather be alone and single than to spend another moment with MJ. Plain and simple, that’s just a Spider-Man story I don’t want to tell and it’s not something that I would like to have associated with Peter Parker and MJ. You guys may feel differently, but I just think it’s the wrong thing to do with the character and the wrong message to send. Now, there are those that say, “but he made a deal with the Mephisto, how is that better?” I would at least see something in that statement if it was Peter who conjured up Mephisto. If Peter had no options and then proceeded to perform some ritual in order to invoke Mephisto, or in essence reached out to him as a last ditch effort, then yes, I would agree because now you’re validating and saying it’s okay to seek out the Mephisto guy to fix a problem. But, that’s not what happened. It was Mephisto in this case, as he is prone to do, who comes to Peter at his weakest moment and uses this to his advantage. Why? Because he’s a villain. This is a very important distinction, Peter is used by the bad guy, taken advantage of, and let me add it’s not the first time a villain has taken advantage of him. I hadn’t been reading Spider-Man comics for a while when the One More Day storyline happened. Peter’s deal with demonic villain Mephisto ensured that I wouldn’t go back to Spidey-land for a good long while. If Marvel was walking back the personal growth of one of its most important characters, then why should I stick around? Marvel wanted Peter Parker to be unmarried. They wanted him less attached. I disliked that. Marvel was going to keep Spider-Man in a place where he could never work on a partnership that could help him deal with the burdens of his double life. It seemed sadistic. In contrast, Renew Your Vows feels like a relief. If Peter Parker’s ethos is all about power and responsibility, then he should be allowed some measure of reward for doing the right thing time and again. There’s more to Renew Your Vows than just a tie-in to Marvel’s big summer crossover. This series holds the tantalizing possibility of being part of the architecture of the re-integrated Marvel Universe. Big changes will be coming to the company’s superhero landscape once Secret Wars is over. One of them might be a Spider-Man who’s married again. A recent preview had Miles Morales—Peter’s successor in the alternate reality Ultimate Universe—on a new Avengers team. That glimpse of the future comes after the universe get re-assembled but, right now, Marvel is being vague about Peter’s status after Secret Wars. It’s important to note that no one called Miles Morales “Spider-Man” during that short preview, so it’s just as likely that Peter Parker will still be the main web-slinger. The best way to read Renew Your Vows #1 is as a sort of What If, one where Marvel didn’t use a necromantic magic wand to wipe away Spider-Man’s marriage. It’s a good story involving tough choices. Some of them verge on being out of character but, unlike One More Day, the proffered motivation is organic and believable. Whether this What If becomes What Is is something we’ll need to keep reading to see. Spider-Man: Renew Your Vows #1 is out tomorrow at comics shops and digital storefronts.